The Invasion of the Cape Colony was a British military expedition launched in 1795 against the Dutch Cape Colony at the Cape of Good Hope, the southern tip of Southern Africa. The Dutch colony at the Cape, established in the seventeenth century, was at the time the only viable South African port for ships making the journey from Europe to the European colonies in the East Indies. It therefore held vital strategic importance, although it was otherwise economically insignificant. In the winter of 1794, during the French Revolutionary Wars, French troops entered the Dutch Republic, which was reformed into the Batavian Republic. In response, Great Britain launched operations against the Dutch Empire to use its facilities against the French Navy. The British expedition was led by Vice-Admiral Sir George Keith Elphinstone and sailed in April 1795, arriving off Simon's Town at the cape in June. Attempts were made to negotiate a settlement with the colony, but talks achieved nothing and an amphibious landing was made on 7 August. A short battle was fought at Muizenberg, and skirmishing between British and Dutch forces continued until September when a larger military force landed. With Cape Town under threat, Dutch governor, Abraham Josias Sluysken, surrendered the colony. Elphinstone subsequently strengthened the garrison against counterattack and stationed a Royal Navy squadron off the port. Almost a year later a Dutch reinforcement convoy reached the colony only to find that it was badly outnumbered, and surrendered without a fight. 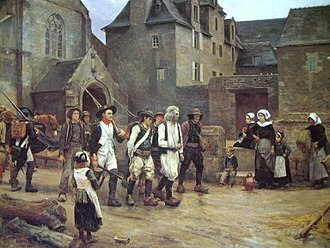 The British occupation continued until the Peace of Amiens in 1802 when it was returned to the Dutch. In 1806, during the Napoleonic Wars, a second British invasion reoccupied the colony after the Battle of Blaauwberg and it remained a British colony until the establishment of the Union of South Africa in 1910. The French Revolutionary Wars, which began in 1792, following the French Revolution, expanded in January 1793, when the French Republic declared war on the Dutch Republic and the Kingdom of Great Britain. This brought the war to the Indian Ocean, where both Britain and the Netherlands maintained lucrative empires. Trade from these empires was menaced by French privateers and warships operating from Île de France, (now Mauritius) but it was protected in the waters off Southern Africa by the presence of the Dutch Cape Colony. Situated at the Cape of Good Hope, the Cape Colony had been established in the seventeenth century to offer a harbour for shipping traveling between Europe and the East Indies, and in the 1790s it remained the only such station between Rio de Janeiro and British India. The Cape Colony was administered from two towns, the larger Cape Town on the wide Table Bay facing west and smaller Simon's Town on False Bay facing south. Neither bay was sheltered from Atlantic storms and both were notoriously dangerous, with winds, currents and rocks posing considerable threats to shipping. Beyond its importance as a resupply port for East Indies shipping the colony had little economic value in the 1790s, and was defended by a garrison of approximately 1,000 Dutch regular soldiers supplemented by Boer militia and local Khoikhoi units, commanded by General Abraham Josias Sluysken and Colonel Robert Jacob Gordon, in total around 3,600 troops. This garrison was centered on the Castle of Good Hope and operated from a series of coastal fortifications which protected Table Bay. False Bay was more weakly defended, covered by only two lightly armed batteries. In the winter of 1794, French soldiers invaded the Netherlands and captured Amsterdam. After the Stadtholder, William of Orange, fled to Britain, the Dutch Republic was reconstituted as the Batavian Republic by the revolutionaries. In Britain, William issued the Kew Letters instructing his colonial governors to cooperate with British occupation forces. At the urging of Sir Francis Baring, the Secretary of State for War Henry Dundas authorised a mission to ensure control of the Cape Colony and eliminate the potential threat it posed to the East Indian trade. The Admiralty sent two battle squadrons to the cape on 3 April 1795, one under Vice-Admiral Sir George Keith Elphinstone and the other under Commodore John Blankett, carrying a small expeditionary force of 515 soldiers from the 78th Regiment of Foot under Major-General Sir James Henry Craig. A larger force under General Alured Clarke was instructed to follow these squadrons on 15 May with troops and supplies for a longer campaign, with orders to hold at Salvador until requested. Blankett and Elphinstone united off the Cape on 10 June 1795 and anchored in Simon's Bay. 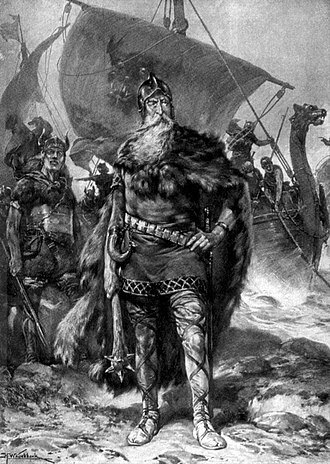 There messages were sent to Sluysken offering an alliance against the French. The Dutch governor was inclined to resist however, evacuating the civilian population from Simon's Town in early July and making preparations to raze the town. To prevent this, Craig landed 800 soldiers and Royal Marines on 14 July, who occupied Simon's Town while the Dutch withdrew to the pass at Muizenberg, through which passed the road to Cape Town. For the next month the two armies observed an uneasy truce, broken by occasional patrols and sniping. During this period, Elphinstone and Sluysken continued negotiations for the surrender of the colony. These negotiations were stalled by disputes in the colonial government regarding the legitimacy of the deposed William of Orange and suspicion concerning British intentions. While the debates continued, British envoys were permitted free movement in Cape Town, making detailed observations of the defences. Elphinstone became concerned that the Dutch positions were too strong for his forces to overwhelm, and on 19 June he sent HMS Sphinx to request assistance from Clarke's fleet. On 7 August, with negotiations stalled, Elphinstone ordered an attack on the pass at Muizenberg. Craig's forces were supplemented with 1,000 sailors from Elphinstone's squadron redeployed on land under captains Temple Hardy and John William Spranger. Among this force were a number of American citizens who immediately deserted to the Dutch and were promised repatriation. At noon on 7 August, HMS America, HMS Stately, HMS Echo and HMS Rattlesnake opened fire on Dutch forward positions. Return fire from Dutch field guns killed two men on America and wounded three more, while Craig's troops were able to advance against the Dutch positions and seize them, with the Dutch defenders falling back in confusion. A second attack by soldiers of the 78th captured a rocky height nearby and a Dutch counterattack the following morning was driven off by Hardy's sailors and marines. The Dutch fell back to Wynberg but British forces were not strong enough to advance, suffering shortages of food and ammunition. Elphinstone's positions were, however, improved by reinforcements, which arrived in the Arniston on 9 August, as well as disorganisation in the Dutch command resulting in stalemate. The British commander subsequently authorised the seizure of five Dutch East Indiamen merchant ships at anchor at Simon's Town on 18 August. Skirmishing continued throughout the month, with stronger Dutch attacks on 1 and 2 September followed by a larger planned assault on Simon's Town on 3 September in which Sluysken committed all his reserves including 18 cannons. 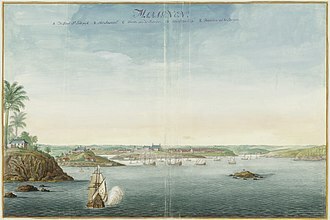 That morning, 14 East India Company ships were seen arriving in Simon's Bay and the attack was cancelled. These ships were the reinforcement fleet under Clarke, who landed 4,000 troops from the 95th and 98th Regiments of Foot, the 2nd Battalions of the 78th and 84th Regiments of Foot, and a contingent of EIC troops from Saint Helena, at Simon's Town for an overland campaign against Cape Town. Clarke's army then advanced against Dutch piquets, losing one killed and 17 wounded in skirmishes. To support this operation, Elphinstone sent America, Rattlesnake, Echo and the Indiaman Bombay Castle to blockade Cape Town and provide artillery support. Outnumbered and surrounded, Sluysken requested a 48-hour truce from Clarke, but was given a 24-hour ultimatum to surrender. Seeing no alternative, the Dutch governor passed control of his colony to the British on 15 September 1795, although he allowed approximately 40 British deserters in Cape Town, mostly impressed Americans, to escape into the countryside before the deadline passed. Total British losses were four killed and 54 wounded. Captured in Table Bay were the Dutch frigate Castor and the 14-gun mercantilebrig Star. The British took both into service, Castor as HMS Saldanha and Star as HMS Hope. Elphinstone's substantial squadron remained on station at the Cape to deter efforts to recapture the colony. Parts of this force were subsequently deployed to bolster British forces in the Indian Ocean. The blockade of Île de France was restored and Arrogant and Victorious were sent to the Dutch East Indies where they would fight an inconclusive battle with a French squadron off Sumatra in September 1796. Elphinstone himself sailed for Madras, where he received reports that a Batavian Navy force had sailed from the Batavian Republic to retake the Cape Colony. The Admiral returned to Cape Town, assembling a large squadron to await the Dutch arrival. Further reports revealed the strength and progress of the Dutch and Elphinstone had ample time to prepare his squadron for their arrival and increase the garrison ashore. The Dutch rear-admiral, Engelbertus Lucas, spent almost six months on the passage and gathered no intelligence on British defences. Thus when he arrived off the Cape he was soon discovered by Elphinstone in Saldanha Bay and intimidated into surrendering without a fight. No further attacks on the Cape Colony were made during the course of the war. Elphinstone returned to Britain in October 1796 and was subsequently awarded the title of Baron Keith for his service in the capture and defence of the Cape, a reward that historian C. Northcote Parkinson calls "on the whole, easily earned". At the Peace of Amiens, in 1802, one of the treaty terms returned the Cape Colony, along with all captured Dutch colonies except Ceylon, to the Batavian Republic. The peace was short-lived, and after the outbreak of the Napoleonic Wars in 1803 a second British invasion was planned, executed in 1806 and victory secured following the Battle of Blaauwberg. 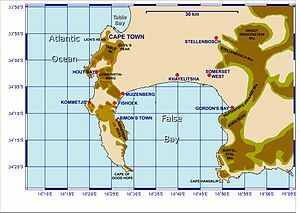 The Cape Colony remained part of the British Empire until its independence as part of a unified South Africa in 1910. ^ Chandler & 1999 , p. 373. ^ Parkinson 1954, p. 18. ^ a b Parkinson 1954, p. 33. ^ Parkinson 1954, p. 32. ^ a b Potgeiter & Gundlingh 2007, p. 45. ^ Chandler & 1999 , p. 44. ^ Potgeiter & Gundlingh 2007, p. 46. ^ Potgeiter & Gundlingh 2007, p. 43. ^ a b Potgeiter & Gundlingh 2007, p. 47. ^ a b c d "No. 13834". The London Gazette. 24 November 1795. pp. 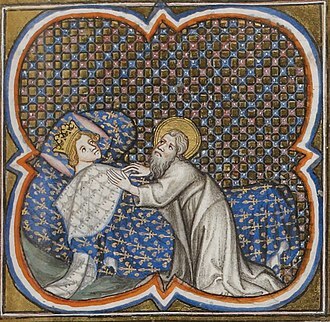 1235–1241. ^ James & 2002 , p. 300. ^ Potgeiter & Gundlingh 2007, p. 48. ^ Clowes & 1997 , p. 281. ^ a b Mostert 2007, p. 306. ^ a b c James & 2002 , p. 301. ^ a b c Potgeiter & Gundlingh 2007, p. 51. ^ a b James & 2002 , p. 302. ^ Parkinson 1954, p. 84. ^ James & 2002 , p. 353. ^ Potgeiter & Gundlingh 2007, p. 55. ^ James & 2002 , p. 373. ^ Parkinson 1954, p. 87. ^ Chandler & 1999 , p. 10. ^ Gardiner & 2001 , p. 65. Chandler, David (1999) . Dictionary of the Napoleonic Wars. Ware, Hertfordshire: Wordsworth Military Library. ISBN 1-84022-203-4. Clowes, William Laird (1997) . The Royal Navy, A History from the Earliest Times to 1900, Volume IV. London: Chatham Publishing. ISBN 1-86176-013-2. James, William (2002) . The Naval History of Great Britain, Volume 1, 1793–1796. London, England: Conway Maritime Press. ISBN 0-85177-905-0. Mostert, Noel (2007). The Line upon a Wind: The Greatest War Fought at Sea Under Sail 1793 – 1815. London: Vintage Books. ISBN 978-0-7126-0927-2. Parkinson, C. Northcote (1954). War in the Eastern Seas, 1793–1815. London, England: George Allen & Unwin Ltd.
Potgeiter, Thean; Grundlingh, Arthur (2007). "Admiral Elphinstone and the Conquest and Defence of the Cape of Good Hope, 1795–96". Scientia Militaria, South African Journal of Military Studies. 35 (2): 39–67. The Batavian Republic was the successor of the Republic of the Seven United Netherlands. It was proclaimed on 19 January 1795, and ended on 5 June 1806, in early 1795, intervention by French revolutionary forces led to the downfall of the old Dutch Republic. The new Republic enjoyed widespread support from the Dutch population and was the product of a popular revolution. Nevertheless, it clearly was founded with the support of the revolutionary French Republic. The political and social reforms that were brought about during the short duration of the Batavian Republic have had a lasting impact. The confederal structure of the old Dutch Republic was permanently replaced by a unitary state, for the first time in Dutch history, the constitution that was adopted in 1798 had a genuinely democratic character. For a while the Republic was governed democratically, although the coup détat of 1801 put an authoritarian regime in power, after another change in constitution, the memory of this brief experiment with democracy helped smooth the transition to a more democratic government in 1848. 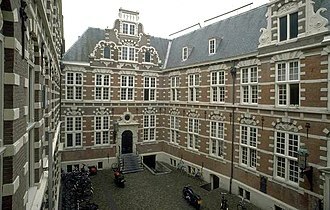 A type of government was introduced for the first time in Dutch history. The new king, Louis Bonaparte, surprisingly did not slavishly follow French dictates either, the final days of the intermittent constitutional monarchy/republic, the Dutch Republic, which had governed the Netherlands since the late 16th century, were quite eventful. Most Patriots went into exile in France, while Hollands own Ancien Régime strengthened its grip on Dutch government chiefly through the Orangist Grand Pensionary Laurens Pieter van de Spiegel. Only two years later, the French Revolution began, which embraced many of the ideas that the Patriots had espoused in their own revolt. The Stadtholder joined the ill-fated First Coalition of countries in their attempt to subdue the suddenly anti-Austrian French First Republic, however, in many cities revolution broke out even before the French arrived and Revolutionary Committees took over the city governments, and the national government also. William was forced to flee to England on a boat on 18 January 1795. The Spanish forces, which included many native Filipino volunteers, consisted of two, and later, three Manila galleons, a galley and four brigantines. They neutralized a Dutch fleet of nineteen warships, divided into three separate squadrons, heavy damage was inflicted upon the Dutch squadrons by the Spanish-Filipino forces, forcing the Dutch to abandon their invasion of the Philippines. The victories against the Dutch invaders were attributed by the Spanish, pursuing their quest for alternative trade routes to Asia, the Dutch reached the Philippines and sought to dominate the commercial sea trade in Southeast Asia. Being at war with Spain, they engaged in privateering activities and they harassed the coasts of Manila Bay and its environs, and preyed on sampans and junks from China and Japan, thereby disrupting Spanish trade. The first Dutch squadron to reach the Philippines was led by Olivier van Noort, on December 14,1600, van Noorts squadron grappled with the Spanish fleet under Antonio de Morga near Fortune Island, where de Morgas flagship, the San Diego, sank. 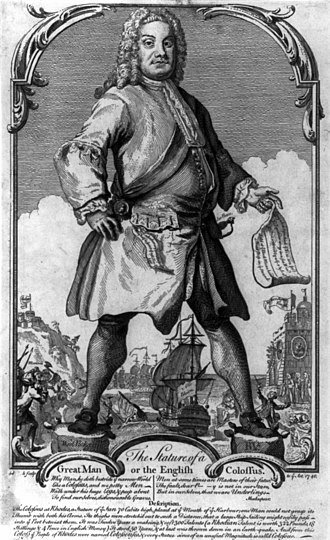 Van Noort managed to return to Holland, thus becoming the first Dutch to circumnavigate the world, on October 1616, another Dutch fleet of 10 galleons under the command of Joris van Spilbergen blockaded the entrance of the Manila Bay. A Spanish armada of seven galleons led by Juan Ronquillo battled against Spilbergens fleet at the Playa Honda on April 1617, Spilbergens flagship, the Sol de Holanda sank, and the Dutch were once again repulsed. From 1640 to 1641, a Dutch fleet of three ships stationed near Embocadero de San Bernandino tried to capture galleons coming from Acapulco, Mexico. These galleons, escaped safely by taking a different route after receiving warnings from a system of fire-signals which was devised by the Jesuit priest Francisco Colin, the entire Philippines was already in dire situation at the time when the Dutch were planning their invasion. 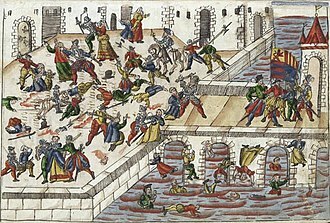 A series of eruptions took place between 1633 and 1640. Food shortage at the same time crippled the city, wars against the Muslims of Mindanao led by Sultan Kudarat in 1635 and the Sangley Rebellion in 1639 to 1640 had taken its toll of lives and resources. Numerous wrecks and losses of sea vessels which sailed to and from New Spain did not only disrupted the Manila–Acapulco trade, the new Spanish governor-general Diego Fajardo Chacón reached the Philippines at the end of June in 1644, together with the Andalusian Captain Sebastian López. Fajardo found the islands deficient in naval strength, aboard in one of the two galleons was the archbishop-elect of Manila, His Grace Don Fernando Montero de Espinosa. On his way to Manila, de Espinosa was stricken by hemorrhagic fever, the citizens of Manila, who were in great need of a religious leader to strengthen their faith in those desperate times, sorrowfully mourned at the untimely death of de Espinosa. On November 30,1645, during the feast of Saint Andrew the Apostle, five days later, on December 5, another earthquake as violent as the first rocked the city. Although no fatalities were recorded, the unstable structures damaged by the first tremor were totally destroyed. The destructive powers of the earthquake reached other provinces of the islands, natives villages were utterly overthrown, as their huts built of bamboos and palm-leaves were leveled. For other sieges with this name, see Siege of Pondicherry The Siege of Pondicherry was a colonial military operation in the early stages of the French Revolutionary Wars. British India was centred on the ports of Bombay and Calcutta. French India was governed from Pondicherry on the Coromandel Coast, British forces in India were considerably stronger than the French, with the British Indian Army supported by British Army detachments and a Royal Navy squadron under Rear-Admiral William Cornwallis. Only Pondicherry was able to resist, and a siege was instigated on 1 August 1793 by Colonel John Braithwaite while Cornwallis imposed a naval blockade, British forces constructed trenches and batteries, often under heavy fire, over the following weeks. Twenty days after the city was cut off, Braithwaite began a bombardment of the defences, within hours the French commander Colonel Prosper de Clermont requested a truce, followed the next morning by an unconditional surrender. 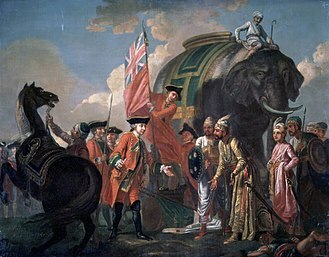 The administration of British India was largely delegated to the East India Company and this force had been heavily engaged in the Third Anglo-Mysore War of 1789 to 1792. Naval support was provided by a squadron under Rear-Admiral William Cornwallis in the frigate HMS Minerva, the French military position in India was considerably weaker than the British, with no significant investment in the colonies since the outbreak of the Seven Years War in 1754. The French held a number of trading ports, including Karaikal, Mahé and Chandernagore but the most important colony was at Pondicherry. Great Britain was not initially engaged in conflict, but diplomatic relations with France were rapidly deteriorating. On 1 February 1793, shortly after the execution of the deposed King Louis XVI, the French National Convention declared war on Britain and the Dutch Republic. Due to the distances involved, it took five months for news of the outbreak of war to reach India, passing through the British consul at Alexandria. On 2 June the news arrived at Madras and passed to Calcutta on 11 June, the Governor-General of India Lord Cornwallis issued instructions for operations against the territories of French India. The naval Battle of the Abrolhos took place on 12 September 1631 off the coast of Bahía, during the Eighty Years War. A joint Spanish-Portuguese fleet under Admiral Oquendo defeated the Dutch after a naval battle. On 5 May 1631 Basque Spanish Admiral Oquendo left Lisbon with a fleet of about 20 men-of-war and he carried reinforcements to Paraíba, Pernambuco and Bahia. On his way back to Portugal, he was to convoy ships loaded with sugar, so as to allow the Dutch extra time to get ready, he headed first for Bahia. Once the Dutch learned of his coming, their fleet in Pernambuco, led by admiral Adrian Pater, despite Pater had 33 ships at Pernambuco, he left 17 in port as he considered only 8 of Oquendo’s to be battleworthy. Finally, on September 12, the two fleets met around the cays and these Spanish men-of-war are accompanied by the 28-gun Portuguese warship São Jorge, 20-gun Santiago,19. This force was protecting ten unarmed Brazilian caravels bearing 1,200 troops under the Neapolitan-born Cmdr, giovanni Vincenzo de San Felice, Conde de Bagnuoli, intended to reinforce the town of Paraíba in addition to 20 Lisbon-bound sugar merchantmen. Standing away from the coast, the formation was driven southeast by contrary winds. On the evening of 11 September the Iberian fleet was sighted by Admiral Pater, at first light the admiral summoned his captains for final instructions, drank a toast of Brunswick beer to the days success. The Dutch admiral Pater had formed his fleet in two lines, Its place was taken by the much larger Concepción of Capt. Juan de Prado, Buenaventura, San Carlos, and San Bartolomé lag astern. Fighting began around midmorning, when Vice Admiral de Vallecillas San Antonio opened fire on Thijssens advancing Geunieerde Provintien, about 15 minutes de Oquendo and four other galleon opened fire on Paters flagship, which steered directly toward Santiago de Oliste with Walcheren. The Dutch held their opening broadsides until point-blank range and grappled, a murderous engagement erupted around each flagship and vice-flag, both sides firing repeatedly into their opponents and yet unable to board. Its place was taken by the much larger Concepción of Capt. Juan de Prado, a chance shot from de Oquendos flagship started a blaze aboard Prins Willem, which the Spanish admiral cleverly directed his musketeers to fire at, so as to hamper Dutch fire-fighting efforts. The flames gained hold and finally drove Pater into the water, along with a few survivors, the remaining Dutch vessels were content to fire from long range –Hollandia and Fortuijn being the only others to become closely engaged-while the Spaniards responded in kind. The day ended in a Spanish victory, although depending on the sources Spanish losses may have somewhat greater. According to David Marley, a Vice-flagship and galleon were sunk and another was taken, with 585 dead, the Dutch flagship and another man-of-war disappeared beneath the waves, leaving 350 dead and missing plus more than 80 seriously wounded. According to Miguel Esquerdo Galiana, the Dutch fleet lost 2,000 men, thijssen showed no inclination to renew action the next day, preferring to limp back to Recife with his mauled fleet on 21–22 September. 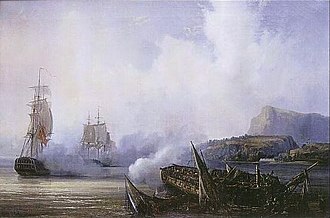 The Capitulation of Saldanha Bay saw the surrender to the British Royal Navy of a Dutch expeditionary force sent to recapture the Dutch Cape Colony in 1796 during the French Revolutionary Wars. In 1794 the army of the French Republic overran the Dutch Republic which became a French client state, the British commander, Vice-Admiral Sir George Elphinstone, reinforced the garrison and stationed a naval squadron at the Cape to protect the British conquest. The Batavian government immediately ordered a force to sail to the Cape. This force comprised two ships of the line and five vessels, all under the command of Rear-Admiral Engelbertus Lucas. Security regarding the plans was weak and the British knew of the operation before Lucas had sailed, the British warned Elphinstone, who further reinforced the Cape. Lucass journey took six months, suffering shortages of drinking water leading to a near-mutinous state among his crews. On arrival, the Batavian fleet anchored in Saldanha Bay to take on water before deciding to abandon the operation. On 15 August 1796 Elphinstones larger fleet discovered Lucass force and trapped it in the bay, aware that resistance would be futile and with his crews in open revolt, Lucas surrendered unconditionally. The ships of the captured Batavian force were taken into the Royal Navy, joining the squadron at the Cape, the Batavian operation did however force the cancellation of a planned British invasion of Île de France. Lucas faced a court martial on his return to the Netherlands, the Cape Colony was not attacked again before the end of the war in 1802, when the Treaty of Amiens returned it to the Batavian Republic. In the winter of 1794 the army of the French Republic overran the Dutch Republic, the French National Convention reformed the Dutch Republic into a revolutionary client state named the Batavian Republic. This event alarmed the government of Great Britain, erstwhile allies of the Dutch, as the Dutch Empire controlled a number of strategically important colonies in the East Indies. To ensure that the Cape Colony did not become a French naval base, the force comprised two squadrons and 500 troops, all under the overall control of Vice-Admiral Sir George Elphinstone, more substantial reinforcements followed. The French Revolutionary Wars were a series of sweeping military conflicts, lasting from 1792 until 1802, resulting from the French Revolution. They pitted the French First Republic against Britain and several other monarchies and they are divided in two periods, the War of the First Coalition and the War of the Second Coalition. Initially confined to Europe, the fighting gradually assumed a global dimension as the political ambitions of the Revolution expanded, French success in these conflicts ensured the spread of revolutionary principles over much of Europe. 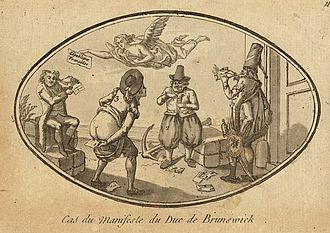 The Revolutionary Wars began from increasing political pressure on King Louis XVI of France to prove his loyalty to the new direction France was taking. In the spring of 1792, France declared war on Prussia and Austria, the victory rejuvenated the French nation and emboldened the National Convention to abolish the monarchy. 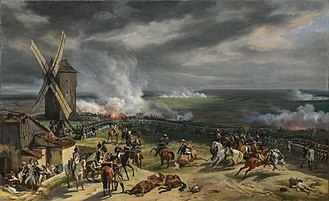 A series of victories by the new French armies abruptly ended with defeat at Neerwinden in the spring of 1793, by 1795, the French had captured the Austrian Netherlands and knocked Spain and Prussia out of the war with the Peace of Basel. A hitherto unknown general called Napoleon Bonaparte began his first campaign in Italy in April 1796, in less than a year, French armies under Napoleon decimated the Habsburg forces and evicted them from the Italian peninsula, winning almost every battle and capturing 150,000 prisoners. With French forces marching towards Vienna, the Austrians sued for peace and agreed to the Treaty of Campo Formio, the War of the Second Coalition began with the French invasion of Egypt, headed by Napoleon, in 1798. The Allies took the opportunity presented by the French strategic effort in the Middle East to regain territories lost from the First Coalition. The war began well for the Allies in Europe, where they pushed the French out of Italy and invaded Switzerland—racking up victories at Magnano, Cassano. However, their efforts largely unraveled with the French victory at Zurich in September 1799, Napoleons forces annihilated a series of Egyptian and Ottoman armies at the battles of the Pyramids, Mount Tabor, and Abukir. These victories and the conquest of Egypt further enhanced Napoleons popularity back in France, the Royal Navy had managed to inflict a humiliating defeat on the French fleet at the Battle of the Nile in 1798, further strengthening British control of the Mediterranean. Napoleons arrival from Egypt led to the fall of the Directory in the Coup of 18 Brumaire, Napoleon reorganized the French army and launched a new assault against the Austrians in Italy during the spring of 1800. This latest effort culminated in a decisive French victory at the Battle of Marengo in June 1800, another crushing French triumph at Hohenlinden in Bavaria forced the Austrians to seek peace for a second time, leading to the Treaty of Lunéville in 1801. With Austria and Russia out of the war, the United Kingdom found itself increasingly isolated and agreed to the Treaty of Amiens with Napoleons government in 1802, concluding the Revolutionary Wars. The lingering tensions proved too difficult to contain, however, in 1789–1792, the entire governmental structure of France was transformed to fall into line with the Revolutionary principles of Liberty and Fraternity. Prior to the campaign the Dutch had been in Formosa for eleven years, but did not control much of the island beyond their principal fortress at Tayouan, and an alliance with the town of Sinkan. Thus the Dutch were able to expand the extent of their territorial control in a short time. 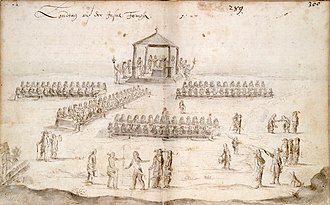 The campaign ended in February 1636, when representatives from twenty-eight villages attended a ceremony in Tayouan to cement Dutch sovereignty, solidifying the southwest under their rule, the Dutch were able to expand their operations from the limited entrepôt trading carried out by the colony prior to 1635. The expanded territory allowed access to the trade, which became very lucrative. It provided fertile land, which the Dutch used imported Chinese labour to farm, the allied villages provided opportunities for Dutch missionaries to spread their faith. The pacification campaign is considered the stone on which the success of the colony was built. Although initially the intention was to run the colony solely as an entrepôt, the Company decided to ally with the closest village, the relatively small Sinkan, who were able to supply them firewood and fish. However, relations with the villages were not so friendly. The aboriginal settlements of the area were involved in more or less constant low-level warfare with other. In 1625 the Dutch bought a piece of land from the Sinkaners for the sum of fifteen cangans, initially other villages in the area, chiefly Mattau and Bakloan, professed their desire to live in peace with the Dutch. 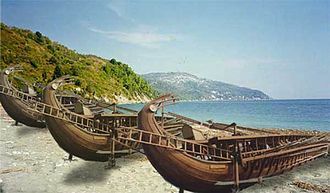 The villages saw that it was in their interest to good relations with the newcomers. The earliest of these was a Dutch attack on Chinese pirates in the bay of Wancan, not far from Mattau, the pirates were able to drive off the Dutch soldiers, causing the Dutch to lose face among the Formosan villages. Encouraged by this Dutch failure, warriors from Mattau raided Sinkan, at this point, the Dutch returned to Wancan and this time were able to rout the pirates, restoring their reputation. 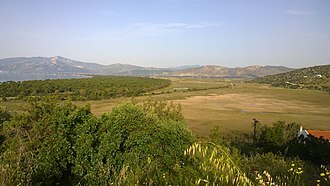 Mattau was forced by the colonials to return the property stolen from Sinkan, the peace was short-lived, because in November 1626 the villagers of Sinkan attacked Mattau and Bakloan, before going to the Dutch to ask for protection from retribution. George Keith Elphinstone, 1st Viscount Keith GCB was a British admiral active throughout the Napoleonic Wars. Fifth son of the 10th Lord Elphinstone, he was born in Elphinstone Tower, near Stirling and he became lieutenant in 1770, commander in 1772, and post captain in 1775. During the war in America he was employed against the privateers, in January 1781, when in command of the 50-gun HMS Warwick, he captured a Dutch 50-gun ship which had beaten off a British vessel of equal strength a few days before. On 15 September 1782 in the Delaware Bay he led a squadron captured the French 38 gun frigate Aigle during which Captain Latouche Tréville was taken prisoner. After peace was signed he remained on shore for ten years, serving in Parliament as member first for Dunbartonshire and he was elected a fellow of the Royal Society in 1790. When war broke out again in 1793, he was appointed to the 74-gun HMS Robust, in which he took part in the occupation of Toulon by Samuel Hood, 1st Viscount Hood. He particularly distinguished himself by beating a body of the French ashore at the head of a brigade of British. He was entrusted with the duty of embarking the fugitives when the town was evacuated, in 1794 he was promoted rear-admiral, and in 1795 he was sent to occupy the Dutch colonies in South Africa thereby establishing the Cape of Good Hope Station. He had a share in the capture of the Cape in 1795. In the interval he had gone on to India, where his health suffered, when the Nore Mutiny broke out in 1797 he was appointed to the command, and was soon able to restore order. He was equally successful at Plymouth, where the squadron was in a state of effervescence, at the close of 1798, he was sent as second in command to St Vincent. In May 1799, he was unable to counter Bruix expedition, Keith followed the enemy to Brest on their retreat, but was unable to bring them to action. He returned to the Mediterranean in November as commander-in-chief and he co-operated with the Austrians in the siege of Genoa, which surrendered on 4 June 1800. The close of 1801 and the beginning of the year were spent in transporting the army sent to recover Egypt from the French. The Cape of Good Hope; looking towards the west, from the coastal cliffs above Cape Point. The courses of the warm Agulhas current (red) along the east coast of South Africa, and the cold Benguela current (blue) along the west coast. Note that the Benguela current does not originate from Antarctic waters in the South Atlantic Ocean, but from upwelling of water from the cold depths of the Atlantic Ocean against the west coast of the continent. The two currents do not "meet" anywhere along the south coast of Africa. The Cape hyrax or "dassie" as it is known in South Africa. It is the Verreaux's eagle's favourite and almost exclusive prey on the Cape Peninsula. The "United East Indian Company", or "United East Indies Company" (also known by the abbreviation "VOC" in Dutch) was the brainchild of Johan van Oldenbarnevelt, the leading statesman of the Dutch Republic. Battle for Malacca between the VOC fleet and the Portuguese, 1606. A lithographic illustration of the Dutch harbour in Taiwan (after 1623). 15th-century Portuguese painting depicting Ecce Homo. The model of naval battle ship (Mông Đồng) during Trịnh's era in XVII. A view of Niebla Fort, one of the many forts the Spanish established around Corral Bay following the Dutch occupation of Valdivia. The Battle of Abrolhos circa 1640, by Juan de la Corte. Oil on canvas. Naval Museum of Madrid.